Law students in the first semester of the Law Programme have access to a series of podcasts specially adapted to their needs. The podcasts are made by Moa Kindström Dahlin and Patrik Bremdal. The Law Programme is making a much-appreciated podcast series for its first-semester (T1) students. In the ‘T1 Pod’, ten episodes have been produced so far. Topics range from study technique and the first examinations to the Convention on the Rights of the Child, EU law and democracy. “We want to complement the rest of the teaching, provide a context and enhance their understanding of law in a community perspective,” says Moa Kindström Dahlin, a lecturer in public law. Moa Kindström Dahlin and Patrik Bremdal, both deputy course directors for the first semester of the Law Programme, are making the ‘T1 Pod’ together. 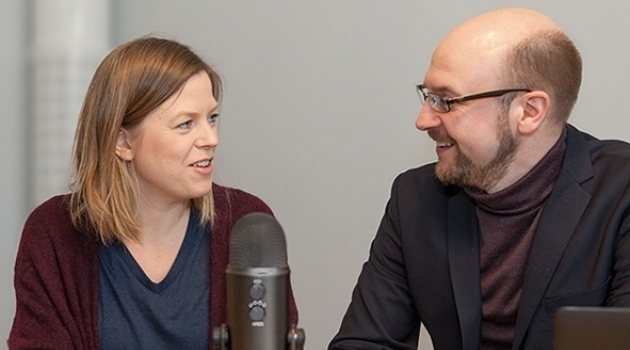 The podcasts are paid for with funding for courses and educational development from the Faculty of Law, and they raise both practical, study-related matters and issue connected with course content. The students are also encouraged to submit questions to the Pod. The producers chose to make podcasts because they are a form used by many students, while ensuring that the same information reaches every student in Uppsala and Campus Gotland alike. It also works well for discussion and debate. “Through scholarly discussion in the podcast, we can show the students early on in their study programme that law gives no clear answers but, rather, is full of values and individual situations in which various values have to be weighed up against one another,” Kindström Dahlin says. “We need to critically examine our own profession and still be lawyers, and we hope that by demonstrating our ignorance of various legal subjects we can serve as a model for scholarly debate,” says Bremdal, a lecturer in public law. “Joking a bit, you might say that the programme brainwashes the students, since it’s important for lawyers to think as alike as possible. But it’s also important to emphasise debate in law, and connect it with current issues in society,” Kindström Dahlin adds. They say that working on the T1 Pod has been fun, and that they have received positive reactions from the students, through their course evaluations and otherwise. “Recently, one new student claims to have listened to every episode ahead of the semester start,” Bremdal relates. The students have also shown their disappointment that so few episodes exist and none have been made for the second semester. The impact of the T1 Pod is also reflected in the fact that, ahead of the first examination after the podcast series had been made to help students prepare for it, the course assistant or mentor received fewer questions than usual. The first podcast episode, they feel, took a great deal of time and was somewhat disjointed. “We wrote a script, which took time. But to make it good, the speaker has to speak freely from an outline of key points,” Bremdal says. Work on the T1 Pod has generally taken time, but also given them ideas for research. “When we were going to make an episode on the prohibition of begging, among other subjects, we realised that no answers were available. So then we took the opportunity of writing a research article,” says Kindström Dahlin. These days, preparation and recording of the podcasts are faster processes. But the sound quality could be better if the team had access to a sound studio. They do fairly little cutting in the sound file after recording but, on the other hand, considerable manual adjustment is needed for the sound file to be published. “A joint technical platform for podcast production at Uppsala University would have made things easier,” says Patrik Bremdal.